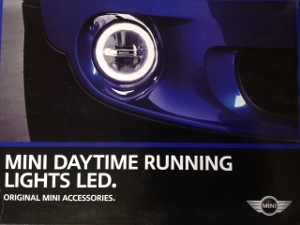 MINI Halo LED Daytime Running / Front Fog Lights for R55 R56 R57 R58 R59 MINI Cooper and Cooper S. MINI has offered these in Europe for a while now, and some have imported them at the cost of over $800 a pair. 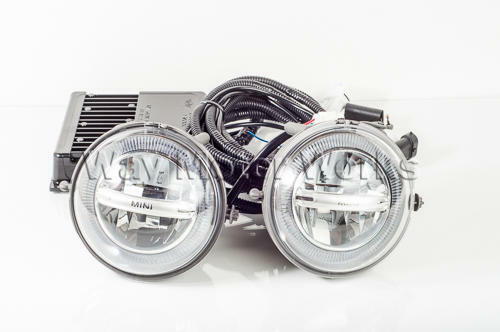 This LED Daytime Running light kit looks the best and can be brighter than the original running lights to make it easier and safer to be seen. 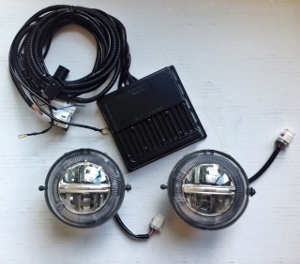 These are a factory MINI OEM LED Driving Light kit, not a cheap aftermarket set, and are the coolest looking lights available. They can be illuminated in three different ways: the upper half of the halo only, the full halo, or the full halo and the fog lamp lit up. This will be determined by how you wire them in. If you have factory fog lights these will be a direct bolt in. If not wiring, programming and additional parts may be required to add them. Love these. Relatively easy to install. Very bright, and give my car an amazing look. There are a bit pricey, but personally, I think they are well worth the money!! Pricey, but well worth it. Very bright & they work perfectly. Would buy again in a heart beat. If I could only count how many times I have been asked about them.